Together with Herbert Boyer, Stanley Norman Cohen demonstrated the possibility of producing recombinant DNA in bacteria in 1973. This they did by combining a gene for frog ribosomal RNA with a bacterial plasmid which was then put into a strain of E-coli for expression. The work laid the foundation for the birth of Genentech, the first company dedicated to the commercialisation of recombinant DNA. Stanley N. Cohen's parents were the children of Jewish immigrants born and raised in the small New Jersey town of Perth Amboy. His mother, Ida (nee Stolz) was a secretary and bookkeeper and his father, Bernard, was an electrician. During his childhood, Stanley frequently helped his father in his entrepreneurial enterprises to supplement the family income. These included the assembly and selling of fluorescent fixtures, transformers and electric fans. In later years his father ran a business selling yarn which he inherited from his late mother, alongside a small electrical supply business. For the first ten years of his life Stanley was an only child, but then his sister, Wilma (Probst), was born. Much of Stanley's early years were spent hanging out with friends near a local river in Perth Amboy and playing basketball and football as well as trying to grow tomatoes using nutrient solutions. Stanley developed an interest in science early on. This was nurtured by his father, who, due to financial constraints, had had to abandon a scientific course he had started at Pratt Institute of Technology, New Jersey, after leaving high school. Following the explosion of the atomic bomb, Cohen's interest in science switched from physics to biology. In addition to his passion for science, Cohen enjoyed playing the banjo, ukulele and composing songs. One of his songs was published and recorded by Billy Eckstine, an international vocalist at the time. Cohen was editor of the his high school paper and associate editor for its yearbook. In 1961 he married Joanna Lucy Wolter, whom he had met while she was a student at Bryn Mawr College and he was a medical student. They have two children, Anne and Geoff. Based on his interest in biology, Stanley decided to pursue a career in medicine and applied to Rutger's University to undertake pre-medical studies. His decision to study at Rutgers was in part influenced by the fact that it was close to his family home so he could support his father who had poor health due to diabetes and neuritis. Following Rutgers, Cohen started studying at the University of Pennsylvania School of Medicine in 1956. While there, in the summer between his second and third year, he undertook a laboratory project studying immunological rejection of foreign skin grafts under the supervision of Charles Breedis in the Department of Pathology. As a result of this project he struck up contact with Rupert Billingham, an expert in transplant immunity working just across the road at the Wistar Institute, who helped him secure a place as a summer student in 1959 in the laboratory of Peter Medawar in London. Cohen completed his MD in 1960. Following this he did an internship at Mount Sinai Hospital (1960-1) and a years residency in internal medicine at the University of Michigan (1961-62). Early on in his medical training Cohen realised he was better suited to an academic career than being a clinical physician. His initial intention was to pursue immunological research, but his ideas changed after working as a Public Health Service officer at the National Institutes of Health (NIH) which he did to fulfil his military obligations following the drafting of physicians in the wake of the Berlin Wall crisis in 1961. This resulted in him working in the laboratory of K Leome Yielding investigating the interaction between the anti-malarial drug chloroquine and DNA. While at the NIH Cohen had the fortune to rub shoulders with many major researchers in the nascent field of molecular biology from whom he began to pick up some skills in biochemistry and genetics. 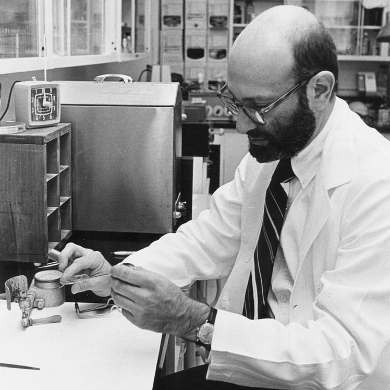 In 1964-5 Cohen completed his clinical training at Duke University Hospital and then spent two years as an American Cancer Society post-doctoral fellow in the laboratory of Jerry Hurwitz at Albert Einstein College of Medicine in New York where he conducted experiments with the lambda bacteriophage. This helped extend his genetic and biochemical expertise. While working in Hurwitz's laboratory he began to develop an interest in how the genes transfered by plasmids conferred resistance to antibiotics in bacteria. This was partly inspired by some contacts he developed with Richard Novick and Stanley Falkow. In 1968 Cohen joined the faculty of Stanford University where he continued to develop his interest in the resistance of bacteria to antibiotics. This research he did alongside helping to set up the Division of Clinical Pharmacology which he headed until he moved to the Department of Genetics in 1978. Stanley Cohen is most well-known for his innovation with Herbert Boyer of recombinant DNA technology which they published in 1973. Together with Boyer, Cohen showed it was possible to transplant DNA segments from a frog into a strain of Escherichia coli using pSC101, a genetically modified plasmid, as the vector. This demonstrated for the first time that DNA could be transplanted and propagated in a different species by attaching it to a vector indigenous to the recipient. While devised as part of a basic scientific project to understand the biological mechanism of antibiotic resistance, Cohen and Boyer's technique was immediately understood to have major practical applications. The advantage of their method was that it could be deployed by scientists in any laboratory with modest genetic and biochemical facilities. Within a short space of time academic and industrial laboratories were using the technique to genetically modify Escherichia coli to produce human proteins such as insulin and growth hormone for therapeutic purposes. This laid the foundation for the creation of Genentech and the rise of the modern biotechnology industry. Cohen gained various awards for his contribution to the development of genetic engineering. This included the Albert Lasker Award for Basic Medical Research (1980), the National Medal of Science (1988), the National Medal of Technology (1989), the Albany Medical Center Prize (1994) shared with Boyer, the Shaw Prize in Life Science and Medicine (2004), and the Double Helix Medal (2009).